Jack was born in our cattery of Fiona and Nemo. 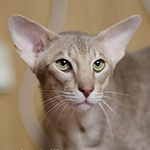 He is very cute boy, he has medium size ears, wide at the base and placed very good. His eyes are light-green color. Jack has a good temper, he is very freandly for people and cats, and he has kitten-behavior (always happy!). I'm planing few matings with him.